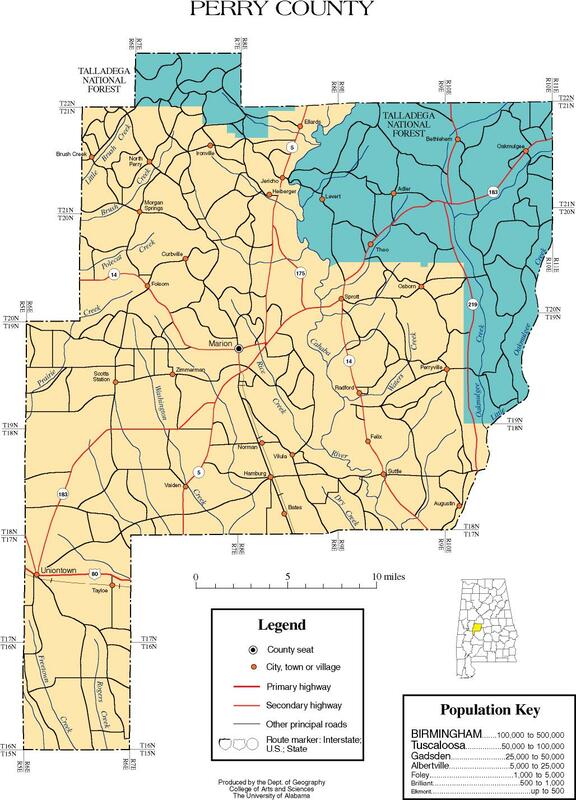 Perry County is a county of the U.S. state of Alabama. As of the 2010 census, the population was 10,591. Its county seat is Marion. The county was established in 1819 and is named in honor of Commodore Oliver Hazard Perry of Rhode Island and the United States Navy. The Perry County town of Marion was the site of a 1965 killing of an unarmed black man, Jimmie Lee Jackson, by a white state trooper, James Bonard Fowler, which sparked the Selma to Montgomery marches. In 2008, the county voted to establish a Barack Obama Day, a legal holiday, every second Monday of November. According to the U.S. Census Bureau, the county has a total area of 724 square miles (1,880 km2), of which 720 square miles (1,900 km2) is land and 4.2 square miles (11 km2) (0.6%) is water. As of the 2010 United States Census, there were 10,591 people residing in the county. 68.7% were Black or African American, 30.3% White, 0.3% Asian, 0.2% Native American, 0.2% of some other race and 0.4% of two or more races. 1.1% were Hispanic or Latino (of any race). As of the census of 2000, there were 11,861 people, 4,333 households, and 3,046 families residing in the county. The population density was 16 people per square mile (6/km2). There were 5,406 housing units at an average density of 8 per square mile (3/km2). The racial makeup of the county was 68.38% Black or African American, 30.86% White, 0.08% Native American, 0.03% Asian, 0.03% Pacific Islander, 0.08% from other races, and 0.54% from two or more races. Nearly 0.86% of the population were Hispanic or Latino of any race. There were 4,333 households, out of which 33.80% had children under the age of 18 living with them, 40.40% were married couples living together, 25.10% had a female householder with no husband present, and 29.70% were non-families. Nearly 27.90% of all households were made up of individuals, and 12.00% had someone living alone who was 65 years of age or older. The average household size was 2.63, and the average family size was 3.23. In the county, the population was spread out with 29.80% under the age of 18, 11.10% from 18 to 24, 23.60% from 25 to 44, 20.70% from 45 to 64, and 14.90% who were 65 years of age or older. The median age was 33 years. For every 100 females, there were 83.90 males. For every 100 females age 18 and over, there were 78.40 males. The median income for a household in the county was $20,200, and the median income for a family was $26,150. Males had a median income of $26,272 versus $16,839 for females. The per capita income for the county was $10,948. About 31.20% of families and 35.40% of the population were below the poverty line, including 48.90% of those under age 18 and 25.80% of those age 65 or over. Perry County is home to Perry Lakes Park, part of the Talladega National Forest, and the Alabama Women's Hall of Fame located at Judson College. Perry County is home to Marion Military Institute and Judson College. ^ a b "State & County QuickFacts". United States Census Bureau. Archived from the original on July 16, 2011. Retrieved May 17, 2014. ^ Owen, Thomas McAdory; Owen, Marie Bankhead (1921). History of Alabama and dictionary of Alabama biography. 2. Chicago: S.J. Clarke Publishing Company. p. 1108. ^ Bello, Marisol (2009-01-26). "Renamed schools, streets mark early tributes to Obama". USA Today. ^ "2010 Census Gazetteer Files". United States Census Bureau. August 22, 2012. Retrieved August 22, 2015. ^ "U.S. Decennial Census". United States Census Bureau. Retrieved August 22, 2015. ^ "Historical Census Browser". University of Virginia Library. Retrieved August 22, 2015. ^ Forstall, Richard L., ed. (March 24, 1995). "Population of Counties by Decennial Census: 1900 to 1990". United States Census Bureau. Retrieved August 22, 2015. ^ "Census 2000 PHC-T-4. Ranking Tables for Counties: 1990 and 2000" (PDF). United States Census Bureau. April 2, 2001. Retrieved August 22, 2015. ^ "Dave Leip's Atlas of U.S. Presidential Elections". Retrieved November 21, 2016.